With three-part vocal harmonies, and an understanding of true, blue collar country, the way it was played back at the turn of the century, Clampitt, Gaddis, and Buck deliver a stripped down, acoustic half-hour of music that is as real as it can get. 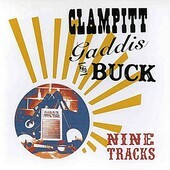 As if they were straight out of Oklahoma, in the 30s, Clampitt, Gaddis, and Buck are musical historians, bringing to life the sound of traditional country, and making it sound refreshingly contemporary without tainting it one bit. The vocal harmonies are the main draw, but the songwriting and purity are both reasons to also check out this trio. Since expanded for the live show, here is country that truly embodies the word, unlike the Nashville pop coming out on your airwaves and passing as country. The pioneers of country music, who are probably rolling in their graves because of the way the genre has gone, are probably smiling every time someone listens to Nine Tracks, the aptly titled record from one of the Northwest's best kept secrets. I'll give it an A.